A unique building of its kind. "Giosos Apostolidis" refuge was built in the summer of 1961, by the Mountaineering Club of Thessaloniki (S.E.O.) at an altitude of (2.697m), on private land. In 1962 a second floor was added, bringing, thus, the number of guests to 80 people. The refuge runs permanently from early June to October, and following agreement with the managers, it also operates the rest of the year. In winter, the refuge hall remains constantly open as an emergency refuge. Giosos Apostolidis was born in Sourmena of Pontus in 1907 and came to Thessaloniki after the Asia Minor Catastrophe. His love and desire for contact with the nature led him to climbing, where soon his skills and talents in mountaineering as well as his relations with friends and companions, appointed him as the unanimously accepted leader. He worked on the spread of climbing in Greece at a time when the sport was in its infancy. He pioneered the foundation of the climbing school in Thessaloniki and, along with the contribution of Georgios Michailidis, introduced climbing to many. He considered of paramount importance the presence of young people in the field of climbing, and always tried to impart his knowledge to them. He offered, selflessly, equipment to those who lacked a bit, enabling, thus, more people to participate in excursions. He contributed with all his strength in the construction of the Club of Greek Mountaineers (S.E.O.) refuge in Olympus, where, along with Garabet Arzoumanian, coordinated the operation of the construction. After the tragic accident that led to his death in Mytika's couloir on May 4, 1964, the Club of the Greek Mountaineers (S.E.O.) of Thessaloniki decided to name the Olympus refuge to Giosos Apostolidis refuge, honoring him for his great work. Joseph (Giosos) Apostolidis, along with Garabet Arzoumanian, both members of S.E.O, who for two consecutive summers selflessly devoted their time and strength for this purpose, had the entire responsibility and the burden of supervision and coordination of the operations on the refuge's construction. At that same time, S.E.O., with the initiative of Giossos Apostolidis, traced and constructed a path from Skourta - Lemos - Kaggelia - Oropedio - Mousses - Zonaria, and constructed a path which was named after Giossos Apostolidis who took its initiative, and was eventually injured at that time. 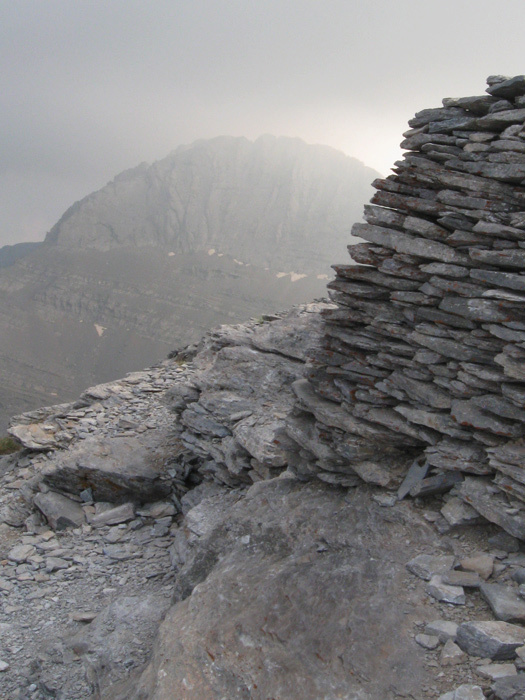 The refuge "Giosos Apostolidis", which was named after its founder's death in a climbing accident in Easter, 1964, in Mytika's couloir, was built to serve the mountaineers in climbing and also during summer and winter ascents. 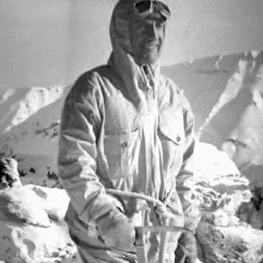 Wearing winter clothing in one of his ascents in mountain Olympus. To serve mountaineers, climbers as well as any other visitor in mountain Olympus.